Take the opportunity of scuba diving in the pure waters of Oludeniz to see the amazing coral reef pattern and colorful fish. It's an amazing experience that you must see to believe. 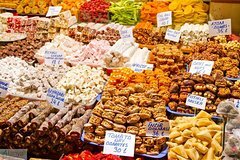 If you have an extended layover at the Dalaman Airport or staying in town, why not consider getting out with some fun activities? We list a few here and there are many more on Dalaman.LayoverIdeas.com. 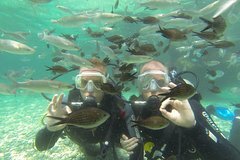 The scuba diving in the Fethiye area is great value and takes place in a number of spectacular reefs & rocky coves, all amid areas of scenic and historical interest. Experience a traditional Turkish bath while you visit Fethiye. 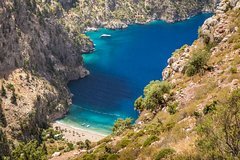 This package that takes approximately 2 hours included pick up service from the hotels in Fethiye or Oludeniz. 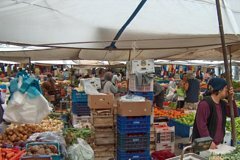 After a short drive in our air-conditioned coach we'll arrive at Fethiye Market which is the biggest market in the region. You'll have a couple of hours to enjoy haggling with local sellers and getting yourself some bargains! Then we will go to Kayakoy 'Ghost Town' which is an abandoned Greek village left over from the forced repatriation of Greeks and Turks. You will have an open buffet lunch and time to enjoy the mystery of Kayakoy. 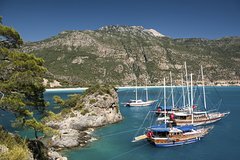 Cruise with a 2-deck boat leaving from Blue Lagoon of Oludeniz. Trek in Butterfly Valley and climb up St Nicholas island to see its relics. A day out in the open sea with lunch included the price.